What will 2017 bring? Long time and beloved residents, Athena and Six, were displaced in 2016 Coincidence? Did they choose to relocate together? 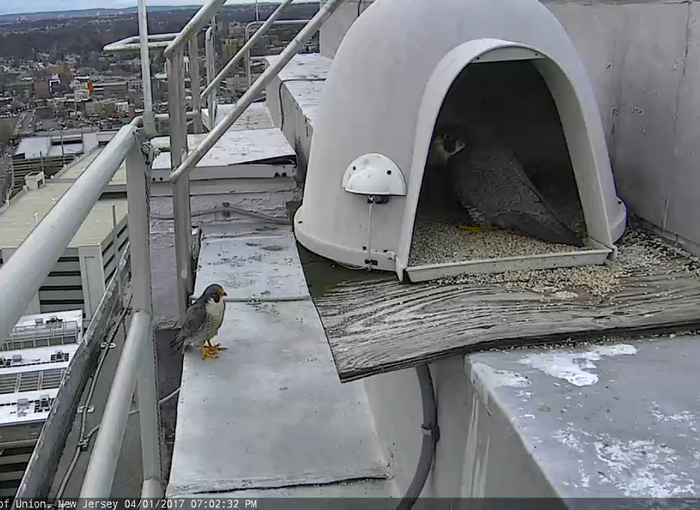 Enter 2 new falcons for 2016: Juliet, b/g 41/AX, a New York gal and her unbanded mate. Will they return for 2017? Stay tuned!!! She's still favoring her foot too so likely still sore. I wondered about her becoming egg bound too..remember Cobb?! 10:47 pm-mom is standing in the igloo. If anyone was recording cam 2 at 8:35. mama just got swooped, and took off with the male. You might catch who swooped her about that time frame. not time for watching muchbut will check in but I have recorder on. dad on eggs. Dad left around 11:05 approximately. 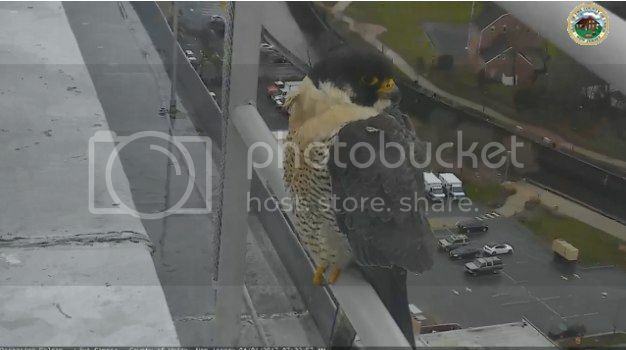 I just saw a bird fly close to building on third cam. When dad came back, no sign of being alert etc. I saw nothing threatening. I rerecorded some when she was in view . I saw her head bowed at 12:48 and she could have been bowing to dad . while she was sitting she did not appear agitated or worried. will go through tape later and get photos. mom is outside by platform. 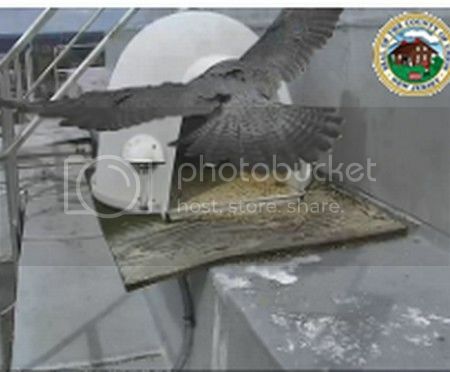 female flew off about 15 minutes ago was not recording at time. union- well, a little bit of someone in area. from about 5:44 pm to to about 5:54pm - mom was some upset. I did video of that time span and saw 2 fly bys but it shows mom going out front twice. might have been no t too much but I think we are all on edge . lots of traffic at this time of year. flybys could have been dad. 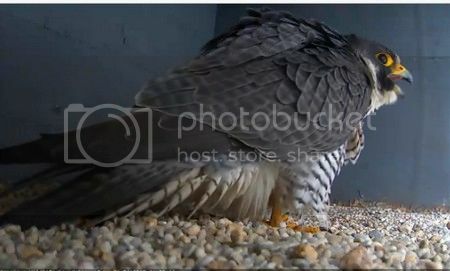 mom was on eggs at 4:54 andat 5:44 she went out to platform and started her kaking and moving all around. Looking up and around. mostly up top. that only 2 flybys were seen, I say whatever was up top . mom seems calm now. poor girl is tired , sh e is sound asleep on eggs. I put recorder on and if anything important I post. yes, Carly, I just think it is passers through. but I think she is giving them the message.